Measure for the right size! Golly Gear products are obtained from many manufacturers who have different sizing and different measuring guidelines. Where appropriate, the page for each harness, collar, coat and sweater for your small dog will have a sizing chart with the manufacturer's recommendations. When measuring your little dog, it's best to use a tape measure like the one used by tailors and seamstresses. Notice the "Neck" measurement for a collar is closer to the dog's ears and the "Neck" measurement for a harness is toward the collarbones. Generally, the "Length" or "Back" is measured from the base of your little dog's neck to the base of the tail. The "Girth" or "Chest" is measured around the dog's chest, right behind the front legs at the broadest part. 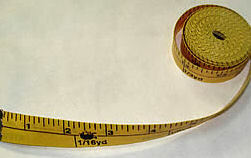 The tape measure should be snug but not tight - you should be able to fit one finger flat between the tape and the dog. Unless the page for the item you're interested says something different, use the guidelines above. mark the measurement on a piece of string, put the string next to a yardstick or other rigid ruler and get the exact measurement.